Rafael Nadal at just 25 years of age defeated Roger Federer today for his 6th title at Roland Garros and 10th grand slam title overall. 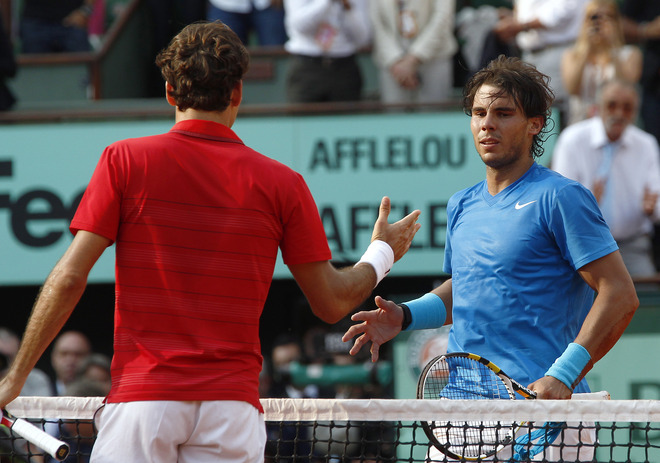 Once again on the red clay, Rafa proved too good and other factors (gamesmanship with calling the trainer at 5-2 down 1st set, prolonged time while receiving on Federer’s serve) ignored at this time, he hangs onto his #1 ranking and is the King of Clay of modern times, arguably of the modern era (Borg debate). Federer has many positives to take out of this year’s French Open. He looks refreshed and with more positive attitude than this time of year in 2010. He played sharply thru the early rounds and into tougher stages of the tournament. He dispatched of quality players (Tipsarevic, Wawrinka, Monfils) easily and showed new life in his semifinal victory over the man of 2011 thus far, Novak Djokovic. Against Nole he employed new tactics, putting pressure and serving strong from start to finish. Taking that same style against Rafa didn’t work out as well as anticipated, but clearly Roger had his chances. The reality of today is he had plenty of opportunities, to close out the first set, to win the second set tiebreak, to break early in the fourth set, and who knows, prolong the match and pull it out. Regardless, we move onto grass. Federer is still unsure if he’ll play this week at Halle. He will consult with his team before making a decision. It will be no easy transition as he is tasked with facing Lleyton Hewitt in his opening match. Have a look at the draw below. More Federer news and updated schedules coming later in the week.